Our Gibeon rings are made from jewelry grade pieces of Gibeon Meteorite. The Gibeon is a fine octahedrite meteorite which streaked into our atmosphere as a brilliant fireball some 30,000 years ago. It crashed into southwestern Africa. The Gibeon meteorite traveled through space for over four billion years before it crashed to earth as a fire ball. It is composed of various alloys of iron and nickel, as well as a number of extremely rare trace elements. The Gibeon meteorite was derived from the core of an extinct planet that was blown apart billions of years ago during the formation of our solar system by a catastrophic impact event. The beautiful crystalline patterns within Gibeon meteorites are known as "Widmanstatten patterns", and are unique to meteorites. Some of the meteorite rings on the market today appear to have grainy, indistinct or non-existent "Widmanstatten patterns". This can occur through improper selection or improper handling of the meteorite. 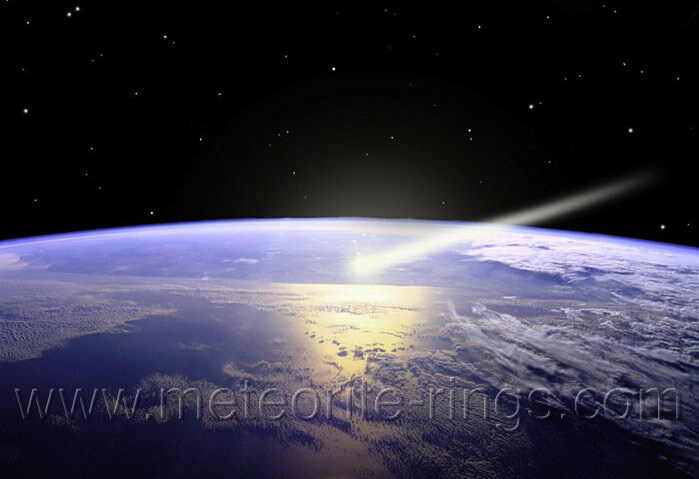 We have extensive experience in the selection and proper preparation of meteorites. So, if a Widmanstatten pattern is important to you, make sure that you can see them when selecting a source for your meteorite ring. Widmanstatten patterns can only form over millions of years of cooling. It has been estimated that, in the vacuum of Space, it took about 1000 years for these molten pieces of planetary core to cool by just 1 degree Celsius! There isn't any material on Earth that exhibits the Widmanstatten pattern of meteorites, and each piece of meteorite has its own unique pattern. The beautiful crystalline patterns characteristic of iron meteorites are more than just beautiful oddities-they tell us about their composition an how long it took for the planetary core from which the meteorite is derived to cool! Our unique, Seamless Seymchan meteorite rings are made from jewelry grade billets of Seymchan meteorite. The Seymchan meteorite was first discovered in 1967, in a stream bed that fed the Hekandue river of the Magadan district, USSR. It has been classified as a IIE coarse octahedrite with main group pallasitic regions. It is composed of approximately 90% iron, 9% nickel and small concentrations of various rare elements. Being a Coarse Octahedrite, the kamacite and taenite bands are larger (coarser) that those in the Gibeon and where they abutt they can have a visible line between the different meteorite alloys. Our Seymchan meteorite rings have beautiful, coarse octahedrite Widmanstatten patterns and no two rings will look the same. We are the first manufacturer of Seymchan meteorite rings in the World and have pioneered the use of the difficult to work Seymchan meteorite in the Jewelry Industry. Our custom meteorite rings are quite durable. That being said, if you would like your ring to stay looking nice you should care for your ring as you would any other fine jewelry. Some common sense will go a long way. Don't wear your jewelry while doing yard work, construction work, automotive work, or similar activities or while handling abrasive or corrosive materials. Don't abuse your jewelry, or hit it against hard objects that could dent or scratch it. The Gibeon and Seymchan meteorites tend to be naturally rust-resistant, so while hand washing and showering are, in our experience, not a problem, we do not recommend exposing your meteorite jewelry to excessive moisture. As with any fine jewelry, our rings should not be exposed to chlorine, bleach, chlorides, house hold cleansers or acids (nor should your hands). Don't wear your jewelry in salt water, the hot tub or swimming pool. Some hand lotions can cause staining of your finger so we avoid wearing hand lotions with meteorite rings. In cold weather or if you go swimming, your finger can shrink substantially causing your ring to fall off, so don't go swimming with your jewelry. After a number of years, the etched pattern of your meteorite ring may be less sharp. If this occurs, the ring can be re-etched. There are thousands of cheap, Chinese made, FAKE meteorite rings being sold online and elsewhere. These rings contain ZERO meteorite and just have a textured surface made to superficially resemble real meteorite to the novice eye. Below is a photo of just two of these FAKE meteorite rings. Don't be duped by these cheap FAKES! We have also the Rust-Prone 'Muonionalusta' meteorites being sold as stable "Gibeon" meteorites. Muonionalusta meteorites looks superficially similar to Gibeon when cut and etched, however, in our experience they tend to be much more prone to rusting, much more common and much, much cheaper. Muonionalusta is what we refer to as a "Ruster" meteorite. When made into jewelry, Muonionalusta is often so unstable that it needs to be plated with some precious metal to temporarily keep it from rusting away. We were recently contacted by a Chinese jewelry manufacturer looking to buy large quantities of Muonionalusta meteorites for use in jewelry and for resale. We informed them that muonionalusta was not suitable for jewelry but that didn't phase them a bit. They said that they needed up to one ton of muonionalusta per year! They sent us a photo showing an example of their meteorite jewelry (which appeared to us to be plated). When we looked them up online, they were selling what appeared to be the exact same product as "Gibeon" meteorite jewelry! Who knows how much fake "Gibeon" has been sold to unsuspecting buyers. In the past few years we have observed several very well known professional meteorite dealers selling Muonionalusta as "Gibeon". When we pointed out their error they corrected their listings, however this serves to highlight the importance of buying your meteorite jewelry from someone that knows the difference between the rust prone Muonionalusta and the Stable Gibeon meteorites. If professional meteorite dealers can confuse the two, how is a jeweler, who is totally inexperienced in meteorite identification going to be able to guarantee that you are getting real Gibeon meteorite in your jewelry? Unlike many, we are experienced professional meteorite dealers. We can distinguish between Muonionalusta and Gibeon meteorites and since we cut and prepare all of the meteorites used in our Seamless line of meteorite rings, we know exactly what kind of meteorite our rings are made of, and we Guarantee their authenticity. Less experienced individuals can easily be fooled by the superficially similar appearance of Muonionalusta to Gibeon, and given the large quantities of muonionalusta being sold as Gibeon these days, it is even more important to purchase your expensive meteorite jewelry from meteorite experts. Buyer beware!